Take the belt highway clockwise. Follow the direction of the A13 highway to Rouen. Leave at "Porte de Châtillon", and take route D906 towards Clamart/Versailles. marked "Petit Clamart", and take D906 towards "Le Petit Clamart". Take highway A1 towards Paris Porte de la Chapelle. Take the belt highway counterclockwise to the exit "Porte de Châtillon", and then route D906 towards Clamart/Versailles. and get off at "les Sablons", just in front of Onera. direction "Robinson RER" or "Chatenay Malabry - Lycée Polyvalent" and get off at "d'Estienne d'Orves / Division Leclerc". Then walk 200 meters up the avenue de la division Leclerc to Onera. for "Bourg-la-Reine" (RER B, kind of metro) and a simple ticket for the bus. 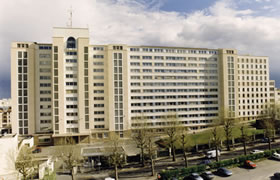 (direction "Issy - Val de Seine RER") and get off at "Les Sablons", just in front of Onera. From Roissy Charles de Gaulle, take Rer B towards Paris, and continue till "Bourg-La-Reine". Then take bus as above.